A note that came in today…thank YOU! I have been meaning to email you for over a year now. 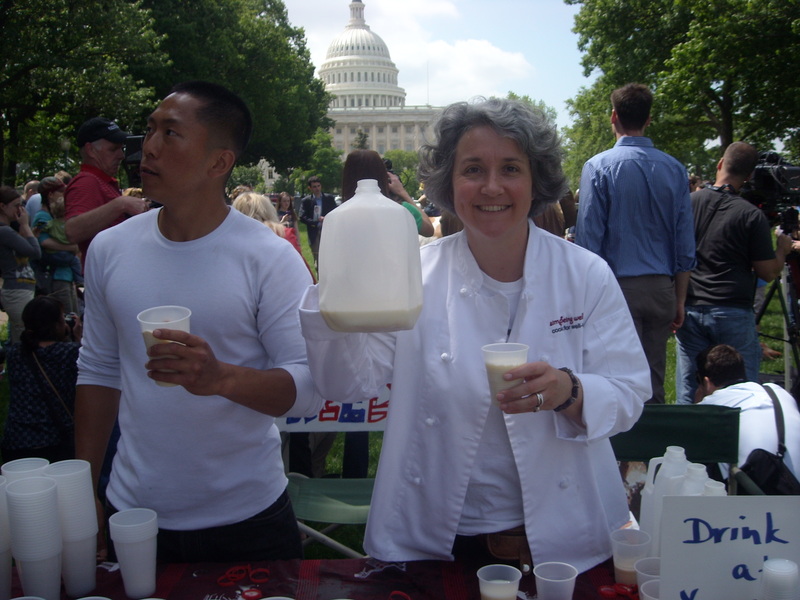 I met you at the raw milk rally at the national mall a year and a half ago, at that time I told you how your pro-bono class you held at your son’s Waldorf school revolutionized my ideas about nutrition. I just wanted to thank you for your work. Seriously, that night when I heard you spoke, a light bulb went on and I said, NOW I understand. I had always prided myself in trying to eat “healthy”, but now I understand the healing power of nutrient dense food. While, my children have never dealt with any serious health issues, I have seen improvement as we have made simple and small changes. I usually did most of our cooking, but soon after listening to your presentation we embraced raw milk, cheese, yogurt, butter. We dropped vegetable oils, love coconut oil, homemade stock soups, fermented pickles, salsa and KETCHUP. I can’t thank you enough for the path you set me on. We now enjoy raw liver, cod liver oil and robust health. Thank YOU, dear mom, for writing! I so appreciate it!! Seems that everyone I talk to that is “doing the GAPS diet” is not actually doing the GAPS diet. FERMENTS are a cornerstone of the GAPS diet, so why aren’t folks eating them and using them as they need to? I’ve got a couple of ideas: 1. They don’t know how to make them, 2. They don’t know where to buy them, or 3. They just don’t realize how important they are to the success of the diet. Ferments are oh so easy to make. I LOVE ferments. I love teaching ferments. I think ferments may be THE MOST IMPORTANT part of a healthy diet today. That’s why I run around giving people fermented condiments and teaching fermentation to almost anyone who asks. If you don’t know how to make them, pick up a book (GAPS, Nourishing Traditions, Wild Fermentation or my book, with Love from Grandmother’s Kitchen: Traditional Cooking Techniques for Well-Being). Learn to make fermented ketchup, mustard and mayo! (how easy is that?) or come to a class! I will be teaching one on Saturday, February 25, inWestminster, CO.
Now that we have cleared up how to learn to make the ferments, or how/where to find them, let’s move on to THE IMPORTANCE OF FERMENTS to the GAPS Diet. They are CRITICAL to the success of the diet. So don’t skip them, folks, and don’t just “kinda” do them. What I call “food ferments” and “bug juice” can be far more powerful than probiotics you take in a pill, for several reasons, not the least of which is that they areFOOD. That means your body will easily use them. They are also truly alive. I continue to be wary of probiotic pills, because although they “guarantee” a certain number of “live cells” per serving as of processing date, they are dying all the time…and how fast? How many are left per serving when you are at the bottom of the bottle? And what was the “process” they used to culture the bacteria, harvest the bacteria, or encapsulate the bacteria? I know you know I always encourage you to get back into the kitchen and make your own…everything…whenever you can. So ferments, ferments. Good for the gut; crucial to the immune system; help clear brain fog…cheap and easy to make. 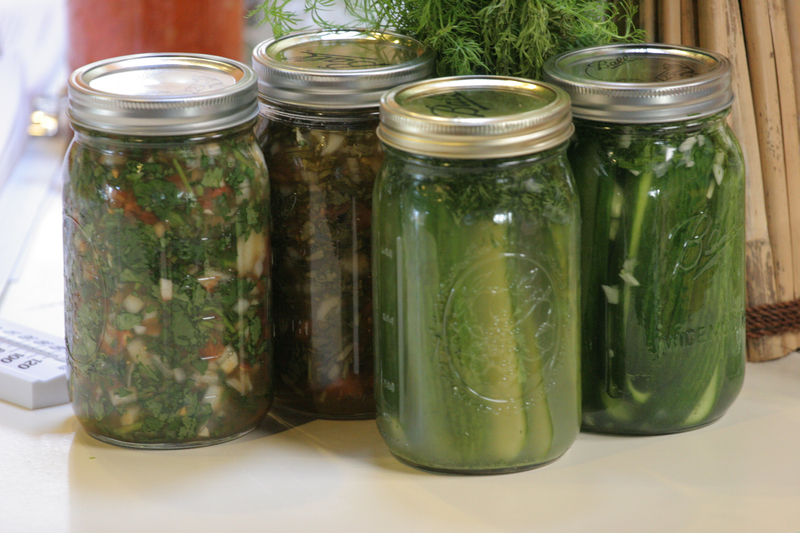 Ferments give a “big” nutritional and immune system “bang for your buck” folks. No refrigerator should be without them. And…please note that homemade ferments can be very powerful. Go slowly, folks! If you have never eaten homemade, real sauerkraut, or fermented pickles, or fruit kvass, take it slow. For those of us who have been eating dead food for a while, ferments can pack a wallop! That means that they can “provoke a detox reaction”. What is a detox reaction? Diarrhea, for one. Dizziness, headaches, aches in bones. At the extreme, vomiting. So go slowly. You just can’t down an entire jar of fermented salsa like you would a dead jar from the store dead zone. A teaspoon or a tablespoon at most to start, and work your way up. Don’t say I didn’t warn you!! To learn how to ferment just about anything–vegetables, fruits, beverages, berries, grains, beans…you get the idea…! buy my book, with Love from Grandmother’s Kitchen: Traditional Cooking Techniques for Well-Being HERE. And stay tuned for an entire weekend of Cooking GAPS (TM) Style coming your way in Colorado, California, and Boston this year!! Fermented cucumbers, aka pickles and salsa! DEEEEEElish! Make your own pickle juice! For all of you who want to learn how to make your own fermented pickles, (really fermented cucumbers–“pickles” are “pickled” and “pickling juice” *DOES NOT* deliver the same immune-boosting goodness that *ferments* do–let’s be clear about that! So go out and purchase fermented cucumbers (Bubbies is a brand) *OR* learn to make your own ferments!! Pick up my 3 DVD set, “Fitting Nourishing, Traditional Food into Your Busy Life“, which teaches the fermentation technique for everything from vegetables to condiments (ketchup) to beverages! as well as all the other techniques in NT or, learn how to make fermented ketchup, mustard and mayo on my DVD, The Ketchup Revolution! In case you haven’t seen this article in the Washington Post food section article, Fermentation: A Wild Way to Make Food Come to Life! Oh, how I love them. Enzyme-rich sauces are made from scratch, in the kitchen, by you and me. They are not found in the store; sauces from stores are “enzyme-dead”. (Remember the DEAD ZONE in the center of the store…?) So it’s into the kitchen we go. Again. And no, it’s not enough that you are eating grass-fed meat and poultry and veggies with pastured butter, although you are on the right track, for sure. But there’s more. I have recently learned, there is more. Much of our eating has become too basic. Sauces have been outlawed, because they are “fattening”, because they take time to make, and because we just plain don’t know how to make them anymore. (When was the last time you served a good old-fashioned buerre blanc sauce? !–perhaps it was your grandmother who did…) Just a grass-fed piece of meat or poultry, or fish, and some veggies with butter is not enough to satisfy. I guess we all learn in our own time. Years ago, Sally Fallon Morell suggested I should teach “sauces”. And I have to admit, I just didn’t get it. I didn’t “get” why, and they just did not seem to be that important in the grand scheme of things. (Sorry Sally!) For more than 5 years I have been teaching how to make stock, how to soak beans and grains, how to make salad dressings and beloved ferments, but “sauces”?? Well, I have to say, I am now one of the converted. I have been converted to a “sauce lover”. Enzyme-rich sauces, of course. Let me tell you the story. It happened quite by accident one dinnertime. May it happen to you. I had made another yummy dinner with grass-fed meat and vegetables served with good salt and pastured butter, and some ferments. It was delicious. There was plenty of food. Good food. Well prepared, Nourishing Traditions style. But I was not satisfied. I was still hungry. So the next night, I served a variation on the same theme…grass-fed meat and veggies served with good salt and pastured butter, and some ferments. Only this time, I went into the kitchen and made anchovy dressing. Rich anchovy dressing. A whole can of anchovies and their oil, lots of good olive oil, and a couple of raw egg yolks from pastured eggs. Good salt. Garlic. I poured it over my veggies and my steak. And that’s when it all came together. Synergy of taste; synergy of nutrients. I have to admit, I couldn’t get enough of this delicious, nutrient-rich sauce. Just divine. And then, after I licked the spoon and nearly the plate, I sat back in my chair and sighed. I was fully satisfied. It was done. I was a “believer”. Enzyme-rich sauces. By definition, they are chock-full of live enzymes. I *love* live enzymes. I will talk about them with just about anyone who will listen! (And as Americans, we don’t get enough of them, even if you cook and eat “real food”; especially if you eat prepared food or processed food.) Enzyme-rich sauces *taste good*, *nutrient-rich*, *help with digestion*, and *make nutrients more easily assimilated by the body*. (As if all of that wouldn’t be enough to send us running for the raw pastured eggs and unrefined olive oil… )What makes them so lovable to me is that they do all of the above (very valiant and healthful and wonderful) AND because they *complete the meal*. You feel sated and satisfied. Your body is getting what it needs. And it signals to you thus. You feel satisfied. I challenge you to try this experiment. Eat the same meal two nights in a row, but on the second evening, add in an enzyme-rich sauce. You won’t be sorry. And I know you’ll be a believer, too! Enzyme-rich sauces, the *secret* to satiety! If you don’t know much about enzyme-rich sauces, come to my class this Sunday morning, September 11 in Great Falls, VA. More information here. And if you don’t live in the area, or if you can’t make it, open up NT to the chapter on Sauces. Just dive in and try one! You won’t regret it. And your tastebuds, body and family will thank you for it! be well!